The power nap: How Long to get the Biggest Benefits? After long hours of work, getting ready to open our Art intervention, we got so tired! We realized we need a good nap. But, do you know how long should be? 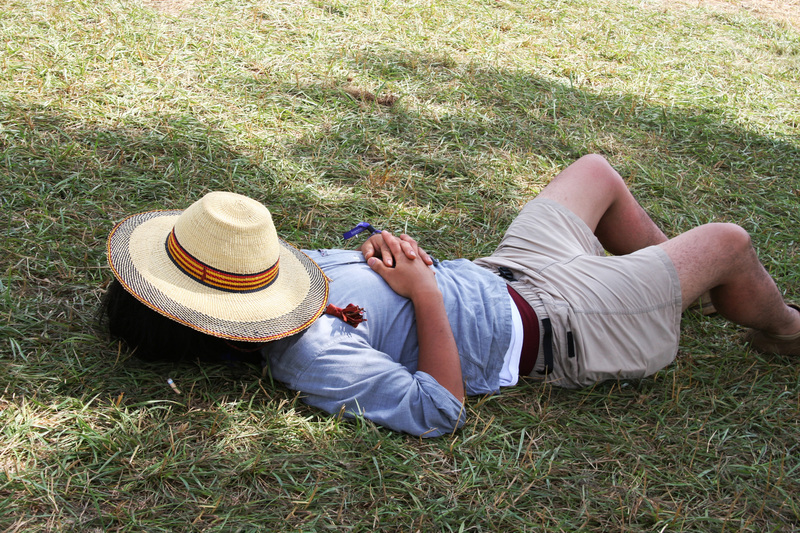 From 10 to 20 minutes: The power nap is ideal for a boost in alertness and energy, experts say. This length usually limits you to the lighter stages of non-rapid eye movement (NREM) sleep, making it easier to hit the ground running after waking up. 30 minutes: Some studies show sleeping this long may cause sleep inertia, a hangover-like groggy feeling that lasts for up to 30 minutes after waking up, before the nap’s restorative benefits become apparent. 60 minutes: This nap is best for improvement in remembering facts, faces and names. It includes slow-wave sleep, the deepest type. The downside: some grogginess upon waking up. 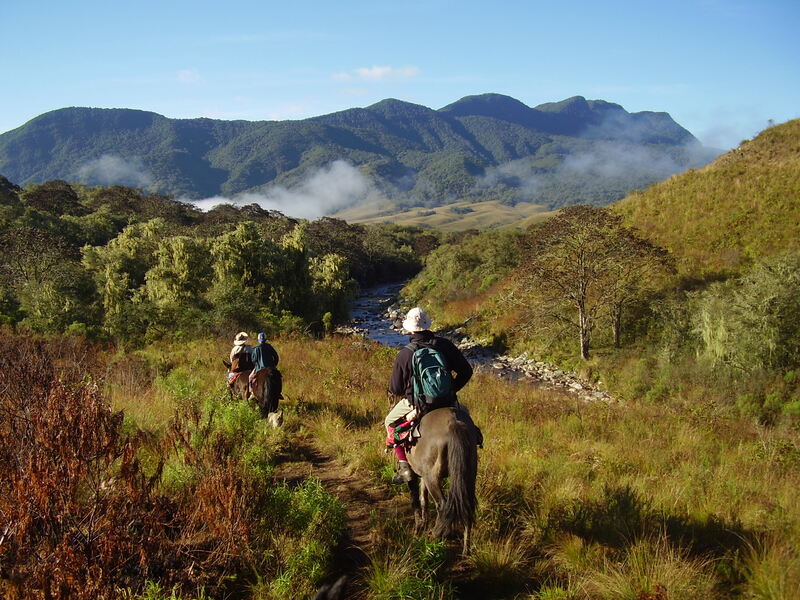 The Yungas is an area in northwestern Argentina known for its plant and animal diversity, its moist lush vegetation and for its diversity of natural resources that has provided to mankind for thousands of years. It occupies less than 2% of the national territory and contains over 50% of the plant and animal species of the country. Additionally, there is a large human population that inhabits the area and generates products that show a history of bond and respect for nature. 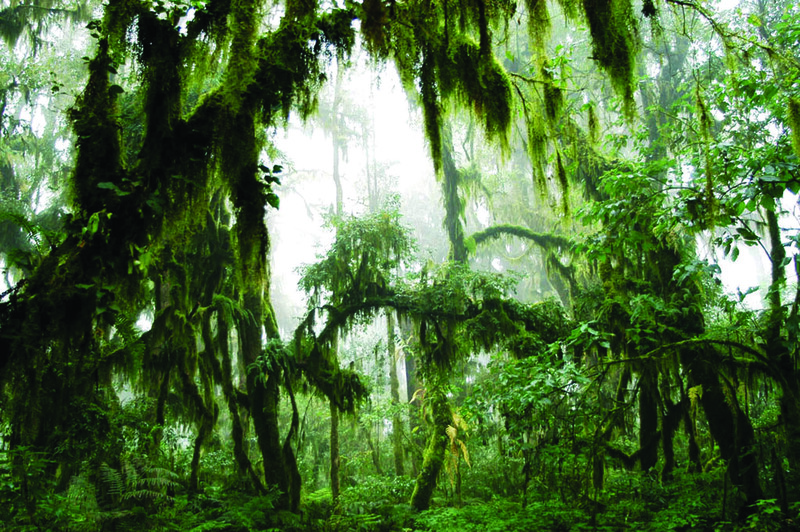 ProYungas Foundation for the developm ent and conservation of the Subtropical Forests is a non-profit organization that works towards the conservation and sustainable development of the Yungas ecoregion (Subtropical Montane Forest) and other subtropical areas of Argentina. To achieve the objective of conservation and sustainable development, ProYungas works actively with different actors that contribute to the conservation and management of natural resources in highly sensitive environmental areas (local communities, enterprises, government agencies, non-profit organizations, researchers, etc.). And that’s why they have developed a special program: “the ambassador program”, in which hotels and restaurants along Argentina help in the tourism development in the Yungas areas. Guess who the 1st Buenos Aires ambassador is? Yes, you have guessed it! : Home hotel. Customers enjoy the quality of the products while contributing with their purchase to the conservation of the Yungas, its nature and its people. Home Hotel is proud to support a brand like PRODUCTOYUNGAS with social and environmental responsibility and compromise. 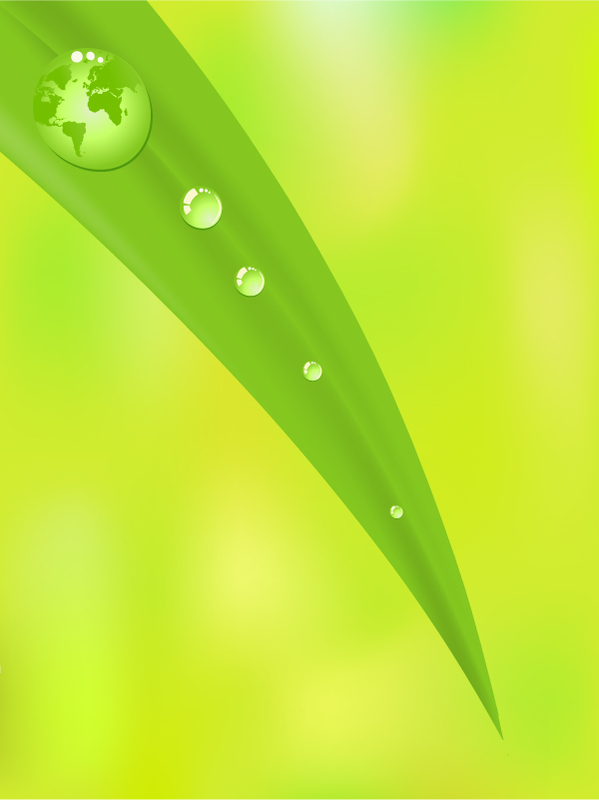 We are happy to contribute to the conservation and management of natural resources. Traveling on a Tuesday, Wednesday or Thursday helps you save more since most people tend to book weekend departures. Even if you’re advance booking, flying mid-week can save you hundreds of dollars per ticket. When traveling, pack your earrings in a pill case to keep them from getting lost. Minimize wrinkles by rolling, not folding, three to four pieces together, with knits on the inside; for even better results, wrap the bundle in a dry-cleaning bag. And tie a ribbon on your luggage (not solid red — that’s what everyone uses), so it’s easier to spot at the airport. Bring a lightweight scarf and sweater even if it is warm weather: planes, airports and some shops and restaurants get chilly sometimes. 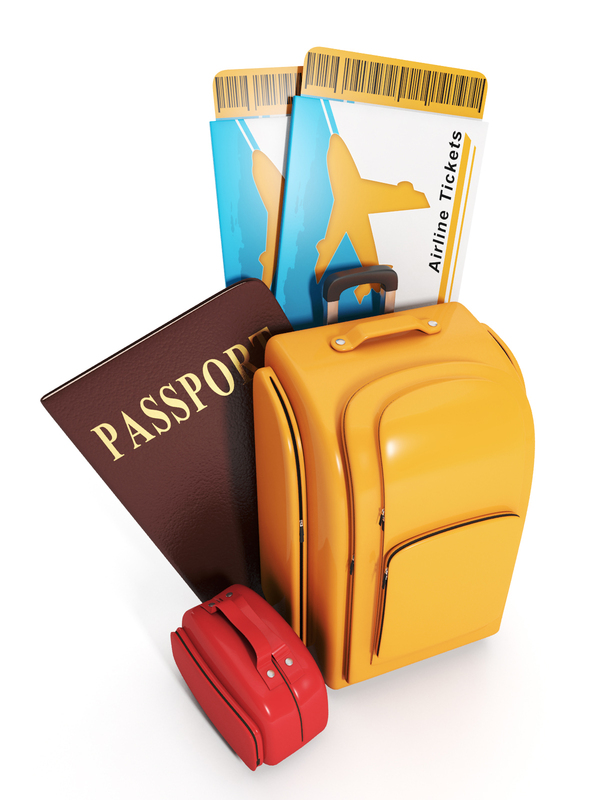 Remember : non-liquid toiletries, spare shoes, prescription medicines, an extra pair of eye glasses, contact lenses or sunglasses, and your camera you’ll carry with you on the plane in your carry-on bag. And don’t forget to take enough clothing in your carry-on to get you through at least a day. Sometimes your luggage makes it to a different destination than you do. 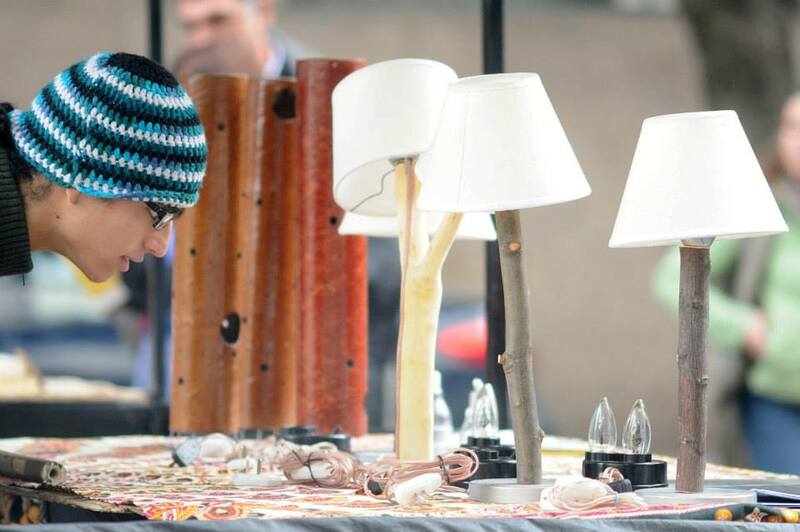 With more than 70 stalls of sustainable entrepreneurs, the Responsible Consumption Fair will be the first permanently established one in Buenos Aires. At the fair, sustainable designers and entrepreneurs can meet and offer their products and services. Responsible consumption is the choice of products and services, not only based on their quality and price, but also for its environmental and social impact. Under a sustainable development paradigm, where economic, social, environmental and also cultural and political factors are in harmony, producers adapt their processes by appealing to creativity and innovation. Values ​​such as the 3Rs (reduce, reuse and recycle), fair labor conditions, solidarity and fair trade is increasingly incorporated when developing new projects. 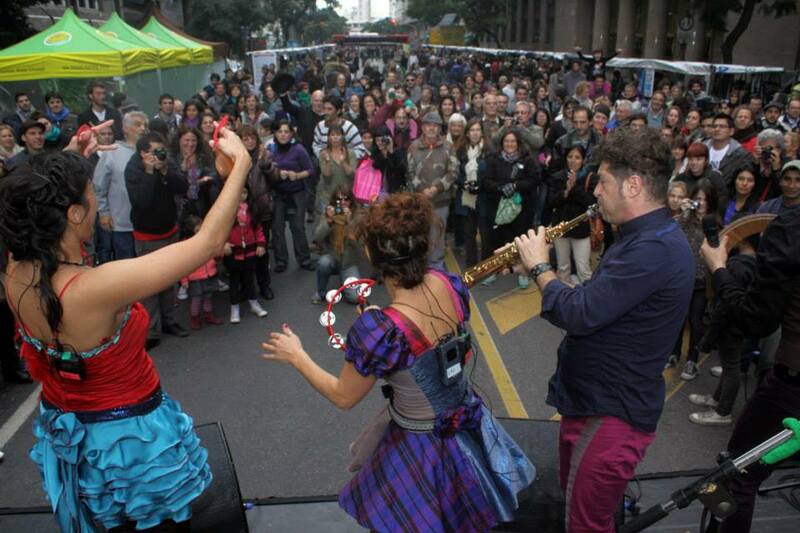 The Responsible Consumption Fair aims to promote sustainability and responsible consumption, as well as being a space of awareness and dissemination of various environmental issues that affect us in the city of Buenos Aires. At the Fair you will find different products, including clothing, toys, objects, accessories, tableware, jewelry, securities and personal care items. There are also other activities planned that include workshops, lectures, live music, and contests. Av Pres Julio A. Roca (Diagonal Sur) 600-800 (between Av Belgrano and Alsina). 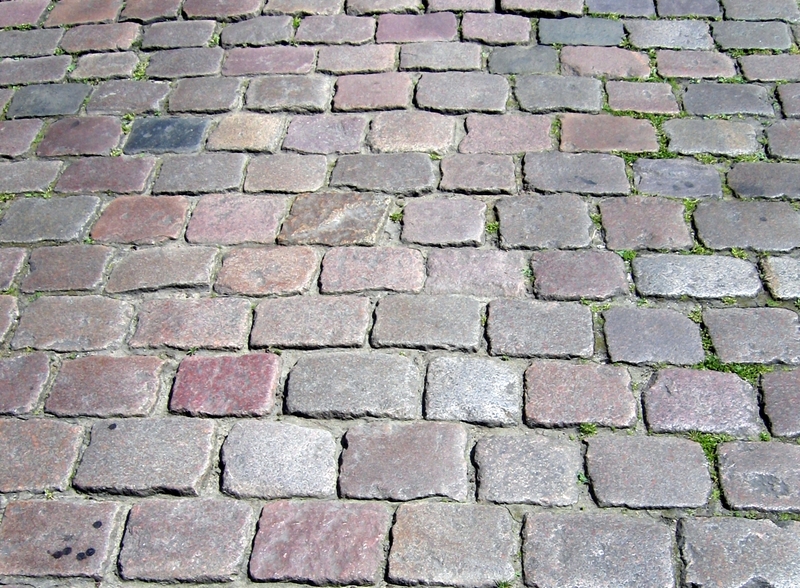 Cobblestones are often retained in historic areas, even for streets with modern vehicular traffic. Many older villages and cities in Europe are still paved with cobblestones, and in recent decades, cobblestones have become a popular material for paving newly pedestrian streets in Europe. Paving with cobblestones has always allowed a road to be heavily used all year long. It also has the additional advantage of not getting muddy in wet weather or dusty in dry weather. The fact that cars make a lot of noise when rolling over cobblestone might be thought as a disadvantage, but it has the advantage of warning pedestrians of their approach. Palermo Viejo is well known as one of the neighborhoods of Buenos Aires where cobblestones can still be found. Low houses, lined up trees and cobbled streets are part of the mystical and bohemian feel of the neighborhood that charmed locals and tourists as well. But lately most of the cobblestones have started to be removed and many streets are getting paved, loosing a highly appreciated feature and changing the identity of this neighborhood. 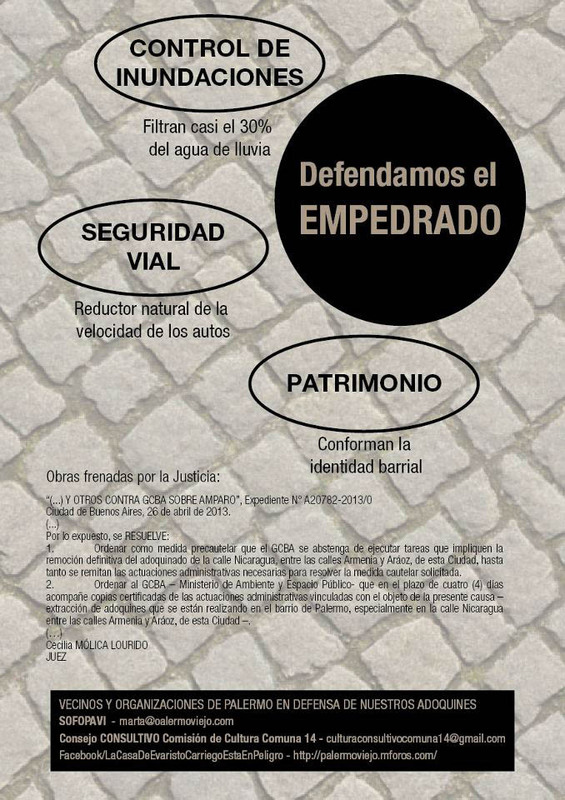 For all this, the neighbors and merchants of Palermo Viejo have started a heritage defense movement of the neighborhood of Palermo Viejo, and signing a “Protection Act” petition to the Government of the city of Buenos Aires. If you happen to be walking around Palermo Viejo, you’ll probably start finding these flyers, defending the cobbled streets, and its many advantages. Cobblestones are part of our “porteño” cultural identity and heritage. Removing them is like erasing our history. Some more people enter. Two girls ask for one coffee each, pay and go. The next order was for seven coffees and it was made by three lawyers – three for them and four ‘pending’. While I still wonder what’s the deal with those ‘pending’ coffees I enjoy the sunny weather and the beautiful view towards the square in front of the café. So, what’s this “pending coffee”? It’s very simple – people pay in advance for a coffee meant for someone who can not afford a warm beverage. The tradition with the pending coffees started in Naples, but it has spread all over the world and in some places you can order not only a pending coffee, but also a sandwich or a whole meal. In Buenos Aires several bars have started to accept these prepaid coffees. 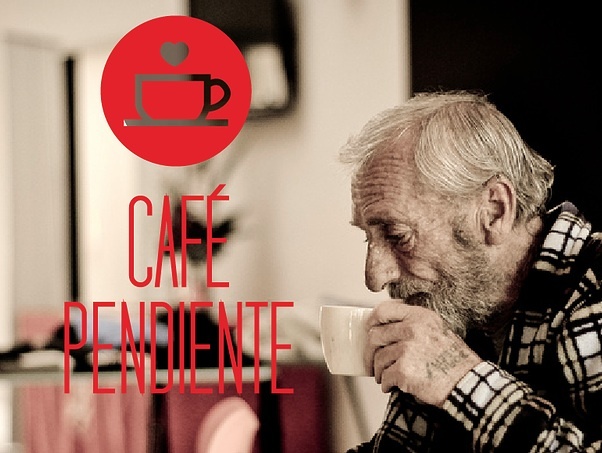 You can check the list in their webiste: http://uncafependiente.com.ar or follow them in their Facebook fan page. So, go to any of these bars and take your coffee and when you ask for the bill, pay for your coffee and leave a pending coffee paid. Now, if a person on the street is cold or just want something warm for breakfast or snack, he can come and ask if there are any pending coffees. And there will be yours waiting. Carry a bag made out of fabric around with you, or start using a bigger bag, so you can put things directly into your bag. It’s simple, it saves oil and reduces the number of bags in landfills. Just smile and say ‘no hace falta la bolsa, gracias’. Leaving the tap running wastes 9 litres of water a minute, the equivalent of what three adults need to survive each day. When you are brushing your teeth, turn the tap off! Bottled water produces 1.5 million tonnes of plastic each year, using 47 million gallons of oil in their production. Buy a water filter or choose drinks that come in glass bottles instead (ideally returnable ones!). Urban recyclers, known as cartoneros, do a wonderful job for very little income. Help them by separating your rubbish. Get to know the ones that pass by your door and ask them what they take. And if you live in a building, speak to your porter about getting everyone involved. Reduce the amount of packaging you take home by not buying produce that comes in packages ready cut, but buy the full product from your local greengrocers. Instead of buying a ready-diced squash, buy a whole one and cut it yourself.